Single mothers working at clerical jobs don’t have a lot of status in a place like La Jolla (OK, anywhere) but for a few years, there were two weeks a year where I owned this place. I had the official scale for the annual Cub Scout Pinewood Derby. 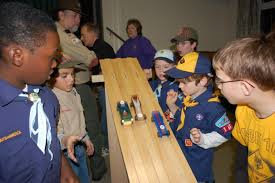 For those of you who never had a Cub Scout, the Pinewood Derby in March is the biggest event of the year. 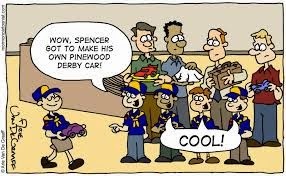 There’s a lot of fancy stuff you can get on-line now, but when I was running the local Cub Scout program, there were only standard issue Pinewood Derby car kits containing a five ounce block of pine in a car-ish shape, and some plastic wheels and axles. It was your job to turn it into a mean aerodynamic racing machine. Keeping the finished product as close to the five ounce weight limit as you could get it was alleged to make the car go faster. Hence the importance of the scale. It didn’t matter what other scale you had access to: the Post Office, the U.S. Mint, the “jewelry” scales at head shops in Pacific Beach (probably the most accurate scales in America). Our Pack scale was the only one that counted. The cars were raced on a gravity track several at a time until the fastest car was determined which went on to the regional competition. La Jolla is nothing if not a competitive community. It’s actually meant as a supervised project simply because tools are often involved but the adult supervision line could get pretty blurred. In fact, someone commented to me at one point that the Pinewood Derby is actually a competition for adults who must be accompanied by a 7-10 year old child. Now, of course, you can search the internet for tips on how to make your car go faster but back then, there was only Inga-net for parents who needed help. 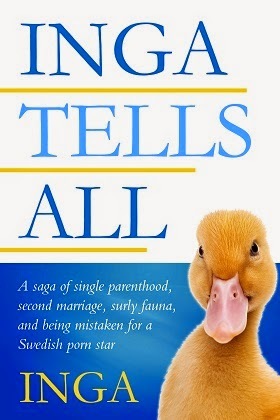 Fortunately, my now-husband, Olof, helped me create Auntie Inga’s Aerodynamic Hints. I came across a copy of this document recently and even I am fairly dazzled that any document attached to my name contained understandable instructions about drag, surface drag, departure vortices and (I’m totally dazzled with this one), smooth laminar flow. The whole idea, of course, was that if you wanted your car to go faster, you needed to reduce drag/resistance which could be accomplished by cutting your little block into a more aerodynamic shape, sanding it with increasingly fine sandpaper, painting it with enamel paint and getting the wobble out of the wheels. It was probably not surprising that some of the work would be outsourced. I would regularly get calls at work from secretaries who had been tasked with prep work on their bosses’ child’s Pinewood Derby vehicle and would inquire, “So just how many times do I have to sand this thing?” More than a few had sanded the little plastic wheels into oblivion and were inquiring about replacements. Before I left for work, I put out carefully labeled envelopes of parts, or even whole new car kits for kids and dads who had gotten a little carried away with a jig saw. Always feeling bad for the kids who were eliminated early on, a fellow Mom, Linda, and I decided that we would make this the kinder, gentler Cub Scouts, probably exactly the sentiment that founder Baden Powell created scouting to combat. Every year, we got a local pawn shop in Pacific Beach to donate a lot of scout-appropriate stuff to us which we spread out on a big table, so that as soon as a kid lost, he could go over and pick out something. Some of the donations, like a guitar and some camp stoves, almost made it worth throwing the race. As we rapidly discovered, there is only so much you can say about a five ounce block of pine. We sat there with a thesaurus and some brochures from cars I’d looked at recently. Problem is, brochures that described cars I could afford at the time more often had descriptors like “peppy considering its 1.2 liter engine” and “Voted least bad in its class by Car and Driver.” An appropriate ribbon category would have been Kid Most Covered in Graphite. But back to the scale. For two weeks a year before the Pinewood Derby, a steady stream of Dads and kids streamed through my house to use the official scale. During the day, I would return calls to some of these Dads during my lunch hour. A snippy secretary would cooly inform me that Mr. Jones was in conference all afternoon and would not be able to take my call. But as soon as I mentioned the word Pinewood Derby, she’d cut me off with a frantic, “DON’T HANG UP! HE’S ACROSS THE STREET HAVING LUNCH. HE ASKED ME TO COME GET HIM RIGHT AWAY IF YOU CALLED!” I’ve never had so much power in my life. (Or since.) From low-class single mom to Pinewood Princess. Everybody took my call. I had the scale. I had parts. The day after the Derby, of course, my Cinderella life was abruptly over. But fyi, if you need them, I’ve still got some boxes of extra axels around someplace.